A comparatively new-comer to the world of baby gear, Joovy is an American company based in Dallas, Texas, that has been in the market for less than a decade. 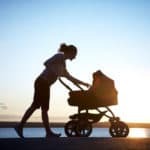 They offer a collection of different types of strollers, a couple of bike trailer strollers, a high chair, play yards and a small selection of toys. Their strollers, however, dominate the line of this company’s products. 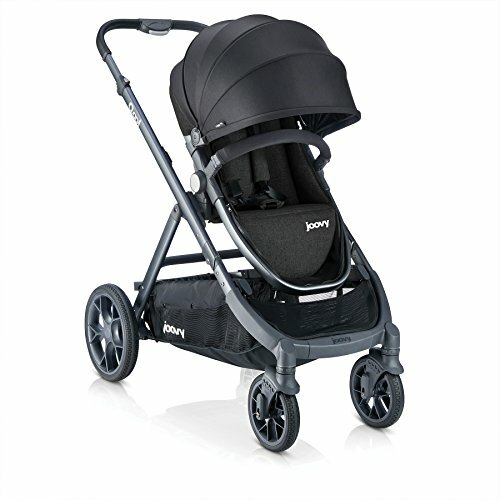 What makes Joovy strollers special? They use durable materials and high quality, bright fabric. 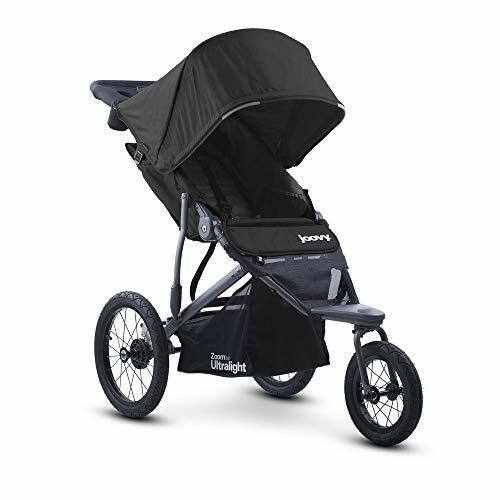 Another specialty are “signature features”on the strollers such as large sun canopies and swing-away snack trays. Extras such as car seat adapters and trays are features that other companies charge for as additional purchases but Joovy includes these with every stroller. Details such as these make customers happy and returning again. You’re going to find that Joovy is a small enough company where you will be heard. They take customer service seriously and more than a few parent reviews have praised customer service for solving their problem quickly and effectively. It is a family-run business, not some huge faceless corporation, and it does make a difference. One of those differences is in their sense of humor – Joovy loves naming their products with double-O’s! 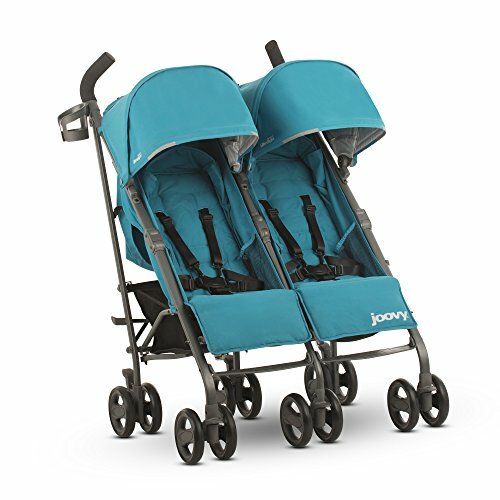 Joovy strollers come in three double models and a triple model all called Caboose. The Caboose Ultralight Graphite is the best Sit and Stand, and the VaryLight is innovative and unique with rave reviews. The classic Caboose and Big Caboose (the triple) have always done well with consumers. How do all these Cabooses differ? Let’s explore them now! The Caboose Graphite is a sit and stand weighing 27.6 pounds and the stand-on platform holds up to 45 pounds. The Caboose has features such as a large sun canopy, universal car seat adapter, three-position reclining seat, large storage basket and a compact fold. The Caboose is most basic sit and stand model in the Joovy line, but it has gotten a huge number of glowing reviews for its durability and ease of use. Parents write in again and again saying that this stroller “saved my life” because it was so much easier for their older child to stand on the platform in back, giving them independence, yet a place to rest when they get tired. This may not be the lightest nor the shortest stand-on stroller, however, it is easy to maneuver and steer and isn’t too long. There are four color schemes to choose from and the Joovy Caboose has gotten very high praise. Read all about this sit and stand in Stroller Envy’s Joovy Caboose review. 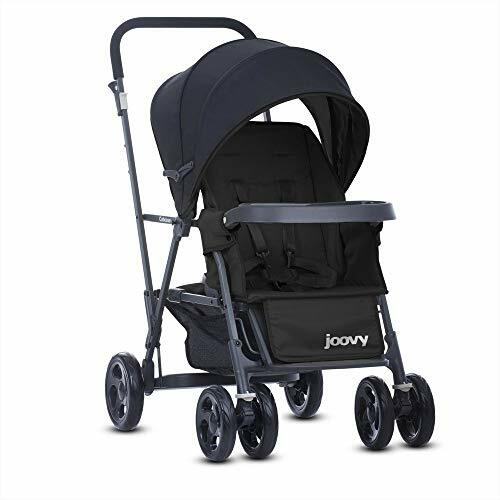 This amazing Joovy is the one of the best sit and stand strollers on the market in terms of weight, length, features and highly rated reviews. The Caboose Ultralight Graphite has streamlined design and upgraded features from the original Ultralight. It has a graphite colored frame, an extendable canopy from the parent console for your bench-sitting child, and a 10% lighter stroller weight. So far customers are writing in with stellar reviews saying it handles just like a single stroller and is lightweight and convenient. Features such as a 22-pound weight, enormous sun canopy with visor, and three-position reclining seat make it a big hit for parents with kids of different ages. One of the new features is a The Ultralight Graphite has a weight capacity of 45 pounds each for the seat and bench for a combined total of 90 pounds. With the Caboose Ultralight Graphite, you get upgraded wheels with sealed ball bearings and a 4-wheel suspension system, making the ride much smoother. When you have a child standing up in back, a bumpy ride could lead to a loss of balance, but not with the Caboose Ultralight! 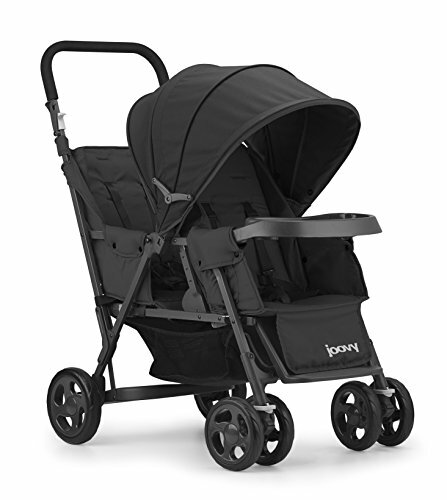 This stroller offers lots more benefits and you can learn all about them in the Joovy Caboose Ultralight Graphite review. “Vary” in the word VaryLight comes from the word “variable,” which means lots of changes. Today’s modern family needs to have versatility and adaptability to the different circumstances that happen day to day. The Joovy Caboose VaryLight hopes to make those changes more smoothly. This is the first stroller that has a unique frame that telescopes in and out to turn the stroller the length of a single to the length of a double in seconds. The most compact length at 43½” can still hold a second child on the standing platform, along with a car seat in the front or just use it as a single stroller. Extended out to the full doubles length at 49¾” your older child has access to the sitting bench and may sit comfortably even with the front seat fully reclined. The front seat reclines in three positions and accommodates a car seat. A car seat can also be placed in the rear position as well. Graco, Peg Perego and Chicco car seats all have adapters available. It’s also got standard features you expect in a quality Joovy product, such as a 5-point safety harness in the front seat and a 3-point lap belt for the bench. A removable, adjustable canopy protects your child from the sun and the stroller comes with a snack tray and a huge underseat storage basket. Front-end suspension smooths out the ride. So far the Caboose VaryLight has gotten strong positive reviews for the coolness factor of telescoping from a single to a double. Parents also like the one-handed push and ample storage. Many families are like this, are you? You have baby #1 already and now you’re expecting baby #2. You go to your prenatal appointment and – SURPRISE! – your “second child” is actually twins! You’ve got to rethink everything, including your stroller. The Joovy Big Caboose is the perfect product for families with an older child and younger twin siblings. It can take two car seats while the big brother or sister stands in back. Each of the two seats has a two-position recline, removable sun canopies and snack trays and can handle up to 40 pounds each. The rear bench has a 3-point harness and can take a child up to 45 pounds. That’s a lot of weight to push around! The wheels have sealed ball bearings and all-wheel suspension for a smooth ride and better maneuverability, but despite this, the Joovy Big Caboose gets high praise because it’s simply difficult to push a stroller this long and heavy as your children grow bigger. It also needs lots of room in your vehicle’s trunk for storage and transportation. However, the parents who do love this stroller say it gives them a sense of freedom to be able to take their children with them wherever they go and they don’t have to worry about the older one lagging behind or getting lost. 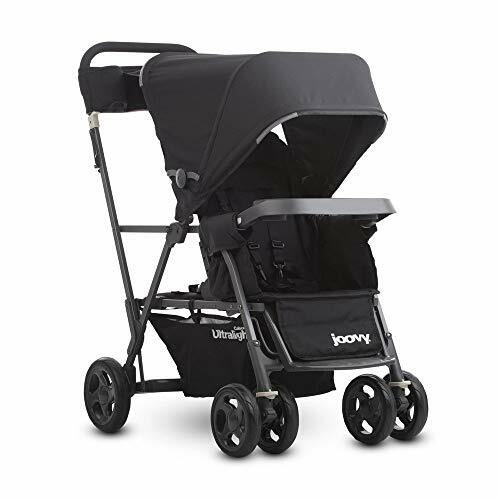 f you’re looking for a super mid range all-terrain stroller or jogger, a Joovy Zoom 360 Ultralight is an excellent option to consider; it is the only three-wheeler in the line of Joovy strollers. The Joovy Zoom 360 Ultralight is designed to provide smooth rides on uneven terrains, such as grass, bumpy walkways and even on sandy beaches because of the excellent rear-wheel suspension system. 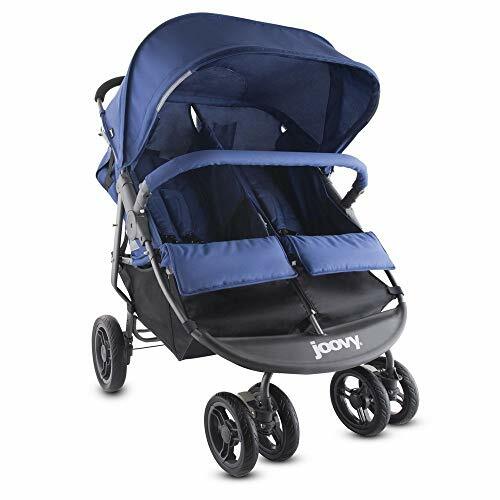 This Joovy all terrain stroller is made of aircraft grade aluminum and the fabrics are made of extremely durable 600D polyester material. Customers really appreciate this stroller’s durability. Many reviews have been written online across different web retailers and the fact that this stroller gets high ratings shows you how much active parents love their Zoom. 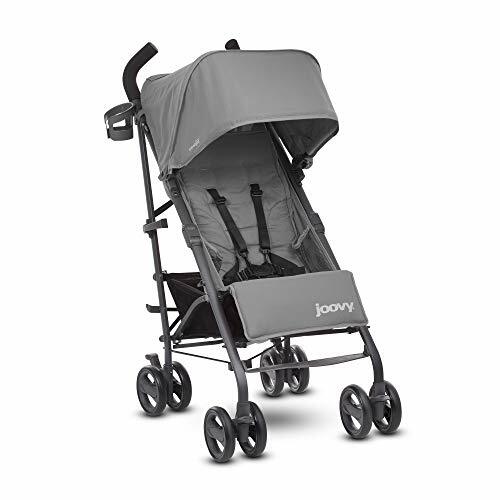 Read Stroller Envy’s Joovy Zoom 360 Ultralight review to find out exactly why. When you think of a balloon, you think of something so light it floats. 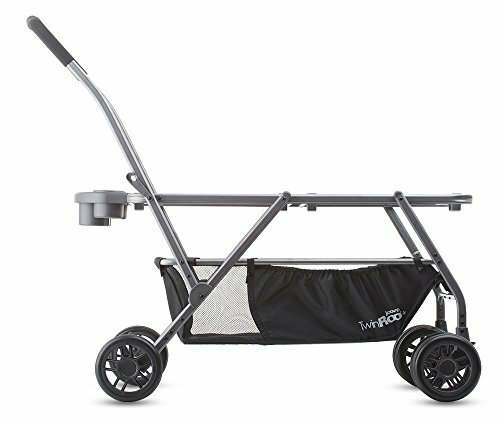 This lightweight stroller is certainly comparable since it weighs only 12.7 pounds! Though this stroller is light weight, it is heavy in features. It has a bassinet mode, in which the seat reclines 160°- or nearly flat. It is suitable for newborns. The stroller also takes most car seats, turning it into a convenient travel system. I like the reversing handle, so that when your baby is so small, you’ll be able to bond with face-to-face contact. In addition to these unique features, you also get two cup holders, a large enough storage basket and a full-coverage sun canopy. A one-handed standing fold frees you to attend to your baby, or to store it in tight storage areas. The Joovy Balloon holds up to 45 pounds in a roomy seat with comfy memory foam and multiple recline positions. This stroller has gotten rave reviews from parents who love the ultra light weight and the streamlined-designed full-coverage canopy. The easy fold, one-handed steering and near-flat seat recline are also big hits. That’s most all the features anyway, right? If you love the Groove, but still think it’s a tad on the heavy side, then consider the Groove Ultralight. It is 4 pounds lighter than the original Groove, weighing in at just under 14 pounds. The Joovy Groove Ultralight has slightly smaller wheels and no padding on the 5-point safety harness. However most of the other features are the same, like the multi-position reclining seat with adjustable leg rest. That alone on an umbrella stroller is a huge plus! You’re also going to get the huge signature sun canopy with peek-a-boo window and storage basket that is large enough to bring along the diaper bag. Your child has little mesh pockets on either side of the seat for a drink and small toys. The handles are tall enough for adults in a wide height range and while the fold has been said to be a bit tricky, it is rather easy to get the hang of it. A carry strap is included for your transport convenience. Parents love the canopy, light weight sturdy frame and reclining seat with the adjustable leg rest. Go Together, Grow Together. The Qool is highly customizable and converts from a single to a double or triple. Accessorize as your family changes and grows. Up to 56 configurations. Add optional seats, car seat adapters, bassinet(s), toddler bench seat, etc. Joovy delves into the luxury category by offering the Qool, a deluxe convertible stroller with first-class design and engineering. The performance and handling of the Qool is superb with a cantilever 4-wheel suspension system. Weighing 21½ lbs, the stroller’s frame is super-sturdy from anodized aluminum and holds your child up to 55 pounds. Newborns need to use a car seat and adapters are sold separately, but babies as young as three months can be in the seat. Your child sits comfortably in a fully padded reversible seat that fully reclines and offers leg support. The canopy has a zippered extension panel so that your child has complete coverage from the sun. A telescoping handlebar adjusts from 37-42 inches, giving you just the right height for your strolling comfort. Plus it has a leatherette covering as an added luxury, and on the bumper bar, too. 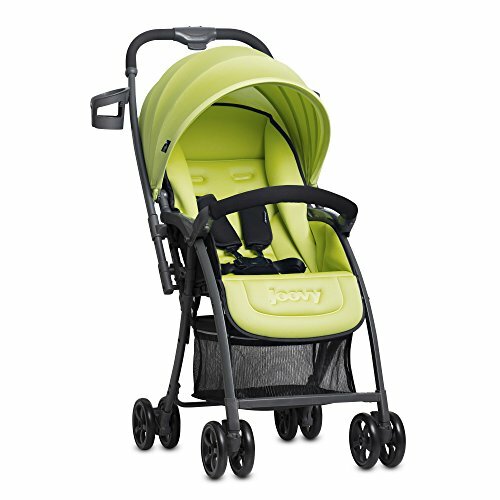 The Joovy Qool has 10 color choices and the removable seat pads are washable. Folding is a breeze and can be done with the seat facing forwards or backwards. And to top off all this goodness, a generous storage basket beneath the seat holds everything you need to bring with you. Parents love this stroller and ratings are high for the great suspension and steering. The adjustable handlebar also got some great compliments since couples are often different heights. This is the kind of stroller you buy if you have one child and are planning for more. 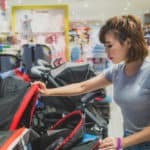 They start as a single stroller, then when baby #2 comes along, all you’ll have to do is eventually purchase the second seat for your older child. It actually saves you money because the additional second seat is less expensive than buying a second double stroller. The Joovy TooFold is by Micralite and is designed for on-the-go families who appreciate an edgy, sporty look. The TooFold has a cool looking frame that is made of ultra-lightweight aluminum and it extends lengthwise, to turn the stroller into a double! Adding a second seat or using the built-in standing board quickly accommodates two. Another option is attaching a big shopping bag in doubles mode. Fold it with one easy motion, and stand it up when you’re done. It sports an extending sun canopy and a washable, removable seat liner.The handle bars are uniquely designed; height-adjustable and multi-position to find just the right angle for your comfort. 12-inch pneumatic rear tires smooths out the ride. The stroller weighs just over 23½ pounds and holds your child up to 45 pounds in the main seat. It does not accommodate newborns because the seat does not completely recline, but babies 3 months and up can ride. So far parents love it – most giving the TooFold high praise, with only some negative feedback. Parents love the versatility and maneuverability. Closely related to the Qool, the Joovy Too Qool is almost the same, but has the capacity to carry two seats. The Too Qool is a full-featured double stroller with a front seat that is reversible and reclines in three positions. The rear rumble seat reclines in two positions. Both seats have adjustable leg rests, padded 5-point safety harnesses and removable, washable padded liners. Newborns ride in a car seat with the proper car seat adapters that you purchase separately, and children as young as six months may ride in the back seat. Each seat holds up to 55 pounds. The storage basket is HUGE, especially when you use the Too Qool as a single. Parents adore the luxury feel of the leatherette handlebar that adjusts to your height. Four-wheel cantilevered suspension and big wheels with sealed ball bearings is the latest in stroller performance and is the best you will find. The oversized canopy in the front has an extra zippered panel for extra coverage. The Too Qool comes in 10 colors and two different frame colors. 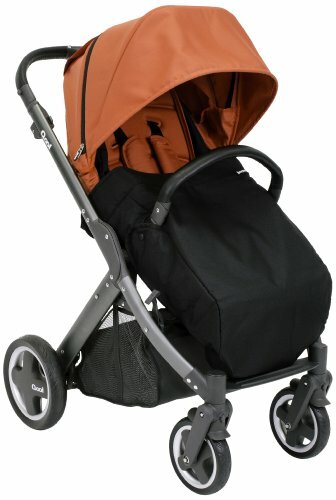 So far parents love their Joovy strollers giving them top marks. Comments are often about the compact size for a double and the overall quality and easy handling. Not to mention how beautiful this luxury stroller looks! 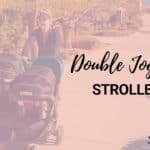 Whether you have twins or kids of different ages, the newest stroller in the Joovy line-up helps you get them around safely and conveniently. This is one of the few double umbrella strollers that has the capacity to hold two newborns WITHOUT a car seat! Each seat has a flat, individual recline, plus an adjustable leg rest that comes up. Pull up the foot enclosure netting and you have a bassinet-like cocoon. Each seat holds up to 50 pounds. The stroller weighs just under 26 pounds, and for a double, that’s pretty good. It includes a cup holder on the side and one behind each seat just above zippered storage pouches. The two storage basket are each big enough to carry a standard-size diaper bag. Canopies are generous with vinyl peek-a-boo windows and each child gets their own little storage pouch for sippy cups or toys in each seat. 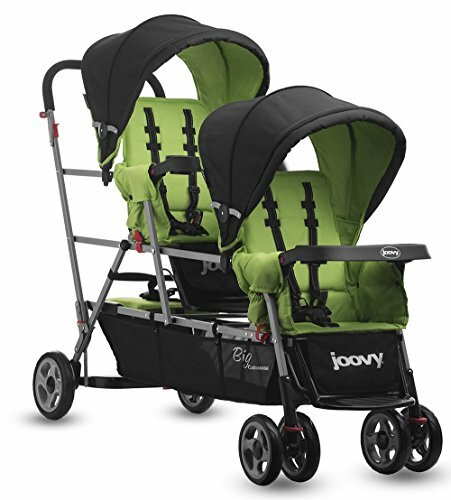 The Joovy Twin Groove rolls on six sets of wheels and has three individual brakes that you have to engage one at a time. The middle wheel might be a problem for taller parents kicking it. But the handles come up to a comfortable height and while maneuverability is easy enough, you will need two hands since it is umbrella style. The fold is a standard umbrella fold, super simple, with an auto-frame lock and includes an adjustable carry strap for convenient transport. So far this newer stroller is getting high praise from parents who like the sturdiness, maneuverability on smooth surfaces and big sun canopies. 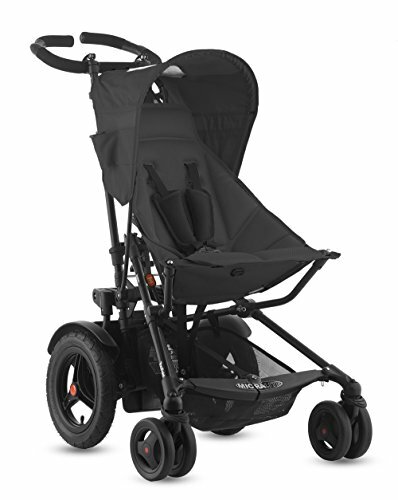 This updated version of the attractive ScooterX2 sports bigger wheels and has a stylish graphite colored frame. Weighing only 28 pounds, it is on the lighter side of twin side-by-side strollers. A 30-inch width means that it goes through standard doorways with ease, yet there is lots of room for your kids. Full-sized seats have a one-handed recline that goes nearly flat. Each child has a mesh pocket for storing little snacks or toys. 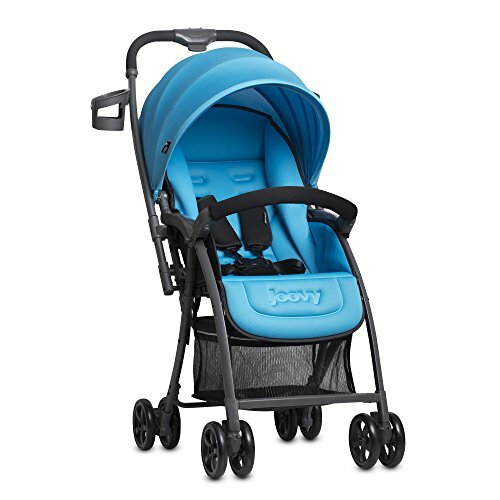 Like all Joovy strollers, the ScooterX2 boasts bright colors in stain and fade-resistant fabric. The ScooterX2 also has the signature huge ratcheting canopy and an enormous storage basket beneath the seat that will carry all your stuff and then some. Children from 6 months and up can ride and the ScooterX2 holds a 90-pound weight limit. What’s been the reaction with this Joovy product? Parents give this stroller good reivews for the one-handed maneuverability, generous storage basket and large sun canopy. Parents with twins also adore the ScooterX2. Use a car seat frame stroller for the first few months of your baby’s life. 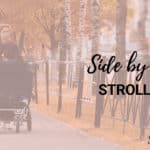 This is an especially good option if you haven’t decided what kind of stroller you want to get or the one you want requires your baby to be three or six months old to ride. Did you ever think that a stroller frame could look and function differently? Joovy has done it! The new Roo is unique in several ways and the first, most obvious is the way that the car seat sits in the frame, as you can see from the photo (car seat not included with purchase). The sideways mount is better for restaurant sittings or when it is time to feed the baby, you can parallel park and not have the handle get in the way. The Roo base width is wider than other standard car seat stroller frames to add better stability. Smaller six-inch rubber wheels enable better maneuverability. And the drink tray is in a different spot too, did you notice? It is set low by the seat to avoid risky spills and frankly, if you’re seated on a park bench, you’ll have your drinks right at your fingertips. Now that is cool. The Joovy Roo accommodates current model car seats from Chicco, Graco and Peg Perego; they just click right into place. Beneath the car seat mount, an extra large storage basket keeps all your necessities in place, though you will have to take off the car seat first for full access. The convenient, compact fold tops off all the fantastic features! Did you ever think that a stroller frame could look and function differently? Joovy has done it! The new Twin Roo+ is unique in several ways and the first, most obvious is the way that the car seats sit in the frame, as you can see from the photo (car seats not included with purchase). Joovy has designed the car seats to sit opposite each other because each baby needs undivided attention and by alternating the direction, the parent does not disturb the other. Prefer your little ones both facing the same direction? Yes, you can! I love the option to face opposite or the same way. The sideways mount is better for restaurant sittings or when it is time to feed your babies, you can parallel park and not have the handles get in the way. The Twin Roo+ base width is wider than other standard car seat stroller frames to add better stability. Smaller six-inch rubber wheels enable better maneuverability. And the drink tray is in a different spot too, did you notice? It is set low by the seat to avoid risky spills and frankly, if you’re seated on a park bench, you’ll have your drinks right at your fingertips. Now that is cool. The Joovy Twin Roo+ accommodates current model car seats from Chicco, Graco and Peg Perego; they just click right into place. Beneath the car seat mounts, an extra large storage basket keeps all your necessities in place, though you need to take out a seat or both to have full access. The convenient, compact fold tops off all the fantastic features!